Allows to directly interface with some cutting machines. Allows to open Perfect Cut optimized projects, generate ISO files and does the trasmission and synchronization of the ISO file with the numerical control, to select the family or the layout that needs to be sent at the machine, to send command to the control (enabling cutting head, low emission roller, etc. ), to visualize axis quotas, machine alarms, to manage specific machine parameters and related tools, to see the cuts in progress, to modify and to send parameters related to material or general configuration (pressures, speed, etc.). It can insert a project in “Bottero” style quotas editor. 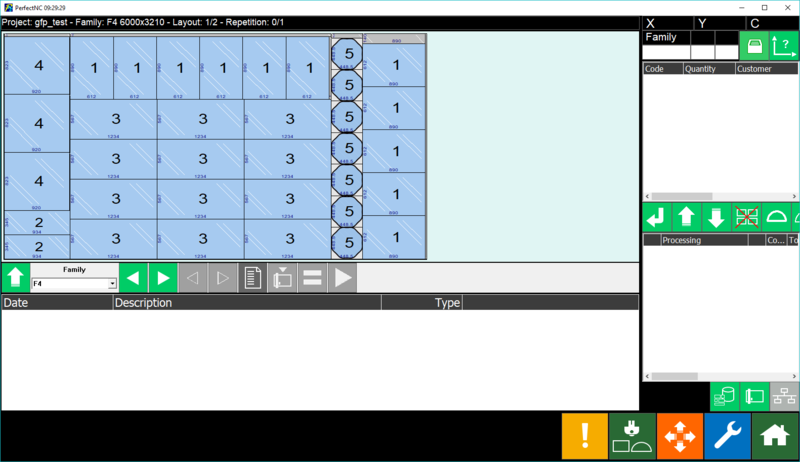 It’s also possible to select a second window that shows the previous layout (for the operator that have to select the glass from the previously cut sheet). Once inserted it’s possible to request for optimization, to send to the machine and to check the cuts sequence with all the numerical control variables under watch. In the interface with GFP machine it is possible to insert pieces to optimize (shapes included), to recall the “light” optimizator, to see tools and to change machine parameters. Step by step on the layout you will see on red color the cuts that the machine has done.